Bollinger Shipyards, Inc. was awarded the 2011 “Award for Excellence in Safety” by the Shipbuilders Council of America for the seventh consecutive year. With focused efforts of continuous improvement, they also earned the 2011 SCA “Award for Improvement in Safety”. On April 24, 2012, The Shipbuilders Council of America (SCA) presented the award during the association’s Spring General Membership Meeting in Washington, D.C. The Award for Excellence in Safety is given to member companies with the lowest Total Recordable Incident Rates (TRIR) based on a quarterly injury and illness survey conducted by the association. This was the seventh year in a row that Bollinger received this award. 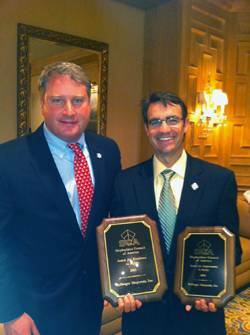 Bollinger also earned the 2011 SCA Award for Improvement in Safety Award. This honor is given to members who have reduced their TRIR by ten percent or more. SCA is the national trade association representing the U.S. shipyard industry. SCA members constitute the shipyard industrial base that builds, repairs, maintains and modernizes Navy ships and craft, U.S. Coast Guard vessels of all sizes, as well as vessels for other government agencies. In addition, SCA members build, repair and service America's fleet of commercial vessels. The Council represents 50 companies that own and operate over 120 shipyards, with facilities on all three U.S. coasts, the Great Lakes, the inland waterways system, Alaska and Hawaii. SCA also represents 78 supplier and affiliate members that provide goods and services to the shipyard industry.